Cut up some kindling, start a fire and get cooking. That simple premise has worked for humanity since the dawn of time. A new wood burning device called the Solo Stove improves upon the good old wood fire, using some simple thermodynamics to create a nearly smoke-free, super hot flame from wood, tinder or other dry, combustable material. 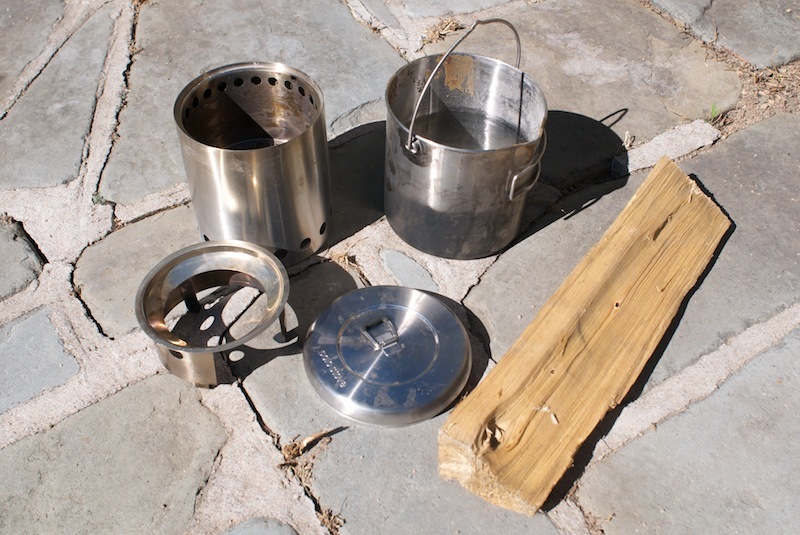 I’ve used the Solo Stove a couple times now in outdoors situations and can attest that it makes a hot cooking fire easily with readily available natural materials. I forgot to wash the pot the last time I went camping, so I took the stove into my back yard to do some measurements and test by boiling 40 ounces (about a liter) of water and to clean the gunk out of the pot. Read on for more details. The Gear: Solo Stove Titan ($120) and Solo Stove Pot 1800 ($70). Both are currently available for significantly less on sale online. 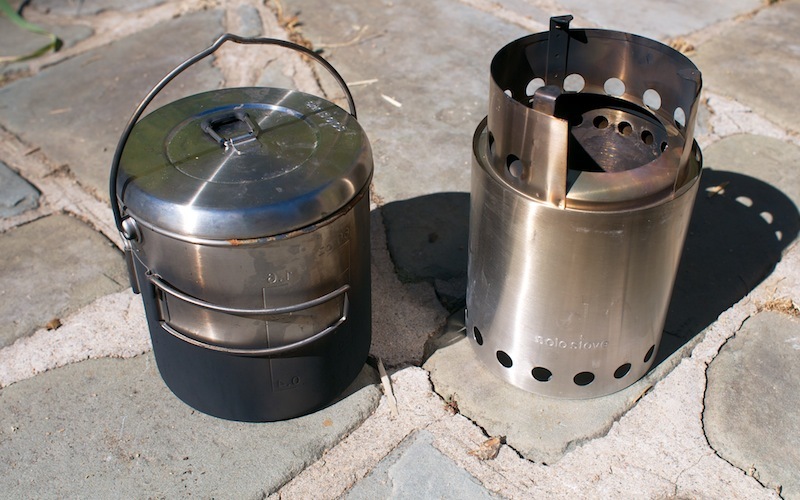 Solo Stove also makes a smaller and larger version of the pot and stove. 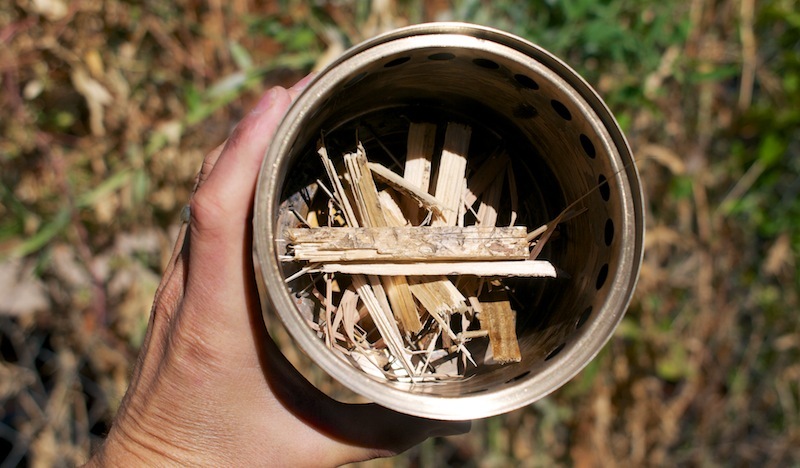 Where To Test It: Backpacking or car camping anywhere there are twigs, pine cones, grasses or other flammable natural materials for fuel. At home as an emergency cooking option. Who’s It For: Campers who want to ditch the petrol. 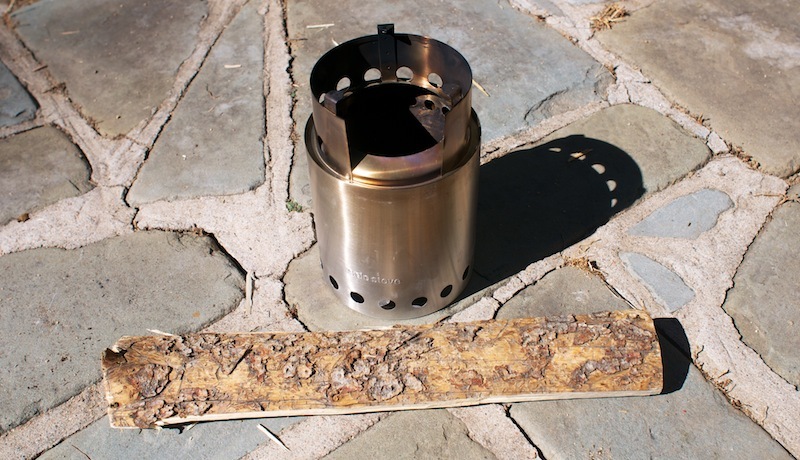 First Impressions: The Solo Stove is a well thought out, rugged design. It really works best when the stove and pot are used as a package. The stove nests perfectly inside the pot, making for a compact kit. The pot also sits perfectly on top of the stove. Using the stove is straightforward and intuitive. Simply build a small fire inside the body of the stove and place the pot on top. When assembled, the pot sits a few inches above the main body of the stove letting air rush through the fire. It gets roaring quickly. 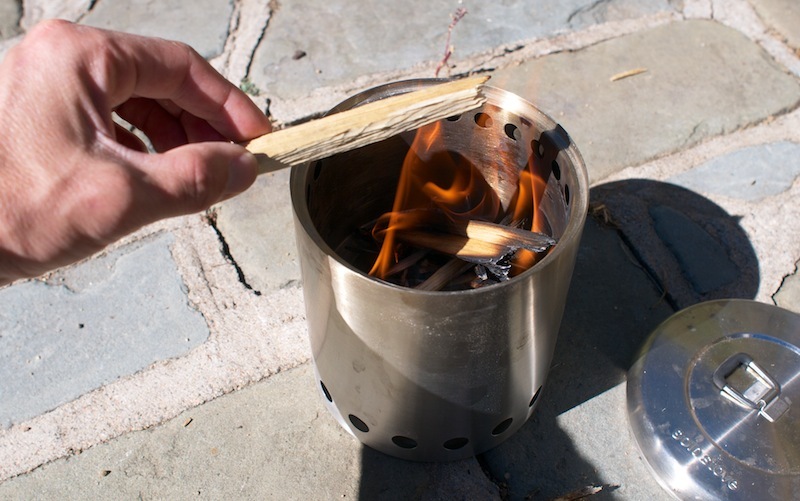 How It Works: The Solo Stove uses the principal of “gasification” to burn wood very cleanly. Basically, the design causes great airflow of pre-heated oxygen past the burning material. The result is a torch of a flame (and very little smoke) from just a little firewood. Stoking The Fire: A small opening at the top of the stove (when assembled for cooking) gives space to shove small sticks into the flame while cooking. I found that, using very dry wood, you do need to keep stoking the fire as the flame will burn down pretty fast thanks to the roaring blaze. 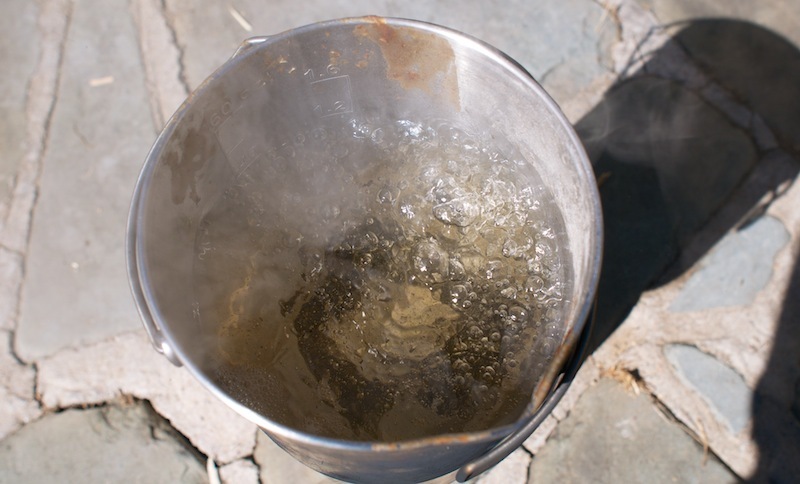 Boiling Water: I boiled about 40 ounces (one liter) of water in 7 minutes using a small amount of wood (about 1 forearm-sized chunk of firewood chopped into small slivers). Cooking: It’s a little tough to keep a steady amount of flame, but with practice, I think most people could cook basic recipes on the stove with little trouble. Low heat cooking could be tough to master though. This thing likes to burn fast. 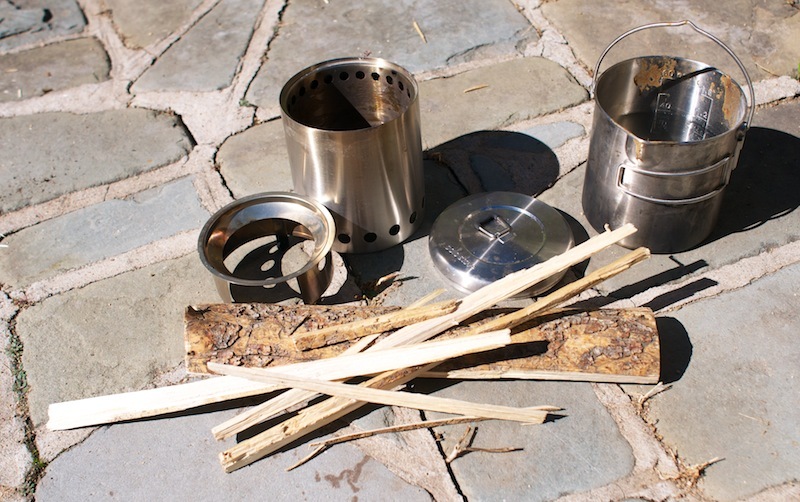 Stove Specs: Packed size – Height 5.6 inches, Width 5.1 inches; Assembled size – Height 7.9 inches, Width 5.1 inches; Weight -16.5 oz; Materials – 304 stainless steel, nichrome wire; Fuel – sticks, twigs, pine cones and other biomass; Boil time – 4 to 6 minutes (32 fl oz of water). Awesome! No need to buy fuel, ever! Just find dry wood and get your fire going. Flaw: No dry wood? No dinner. Sure, it’s an extreme scenario, but in super wet weather when starting a fire is tough, you better plan ahead and pack some dry fuel or be really good at starting a fire in the rain. As with any wood fire, your pots will quickly blacken with soot. The Solo Stove comes with a carry bag to contain the mess, but blackened sooty pots are a fact of life with wood fires. Who Should Buy It: Campers who want to cook with wood fire. Survivalists who want a stove that will work even with no access to fuel. Doomsday preppers. 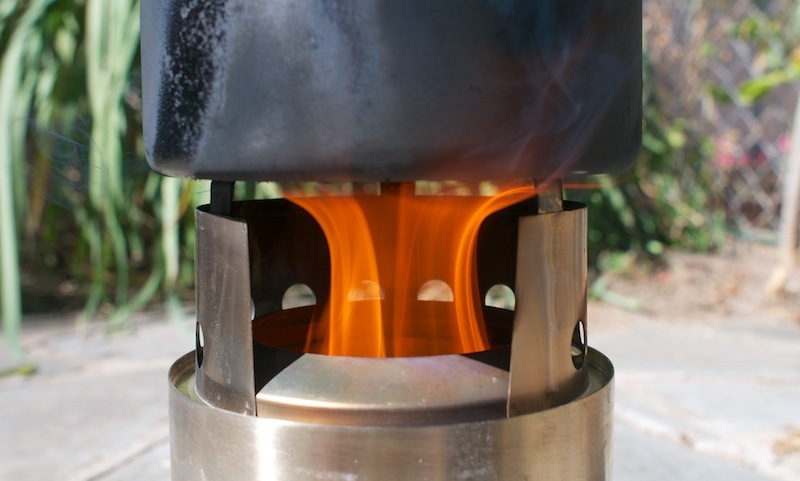 Product Development: A new, much larger Solo Stove design is currently fund raising on Kickstarter. It has already been fully funded, so expect to see it added to the regular lineup soon.